Fixing a leaky roof is a complicated job. It requires that you take a number of factors into consideration. What your plan of action is will depend on the type of roof that you are repairing: shingle, flat roof, wooden shakes, or open valley. Your problem may also revolve around a fixture you’re repairing: flashing, gutters, chimney or vents. Most problems with roof shingles occur when the shingles are missing or curled around the edges. The best way to determine where the trouble spot is located is by checking the shingles above that area. If the shingles are missing, replace them. For a curled shingle in a cold climate, you may need a blow dryer to uncurl it. A flat roof is constructed with a layered mixture of tar and felt. 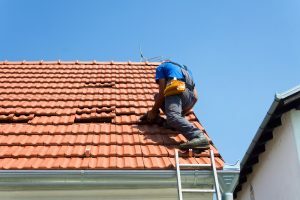 It is usually felt in a low spot on the roof that is the leaky part. Finding the leak is a relatively simple task, it is usually just below the damaged area. Repairing a wood shake roof is similar to fixing a shingled one, but much harder. Wood shakes are not as flexible as shingles. For example, you can’t just pull a nail out of a wood shake. You need to use a hacksaw to unloosen it. Likewise, if a wood shake breaks, you need to replace it with a specially made one. An open roof valley is the V-shaped area created when two parts of the roof meet. This might happen when the roof of an attached garage meets with the main roof of the house. The V-shape of the open roof valley is a natural place for significant amounts of water to collect. Most open roof valleys are constructed of copper or aluminum. When you repair a hole in a valley, you must utilize the same kind of metal that the valley is made of. When you patch the hole, you must use a patch that is two inches larger than the hole. Metal roof flashing is used to make areas around vents, chimneys and skylights watertight. However, flashing can be subject to leaking if gaps develop in the flashing. If this happens, cement must be applied to it liberally. In the case of chimneys, the flashing is applied in two parts. It is not only used on the base but also into mortar up to the cap. All these other areas must be examined, and if there are gaps, resecured. Gutters are the main drainage system for your roof. If they are clogged, that can cause major damage to the exterior walls. To prevent leakage, keep your gutters clean. You can also cover your gutters with mesh wire to stop debris from entering them.